Reminds me of the rush hour in the morning on the english subway when I used to be a working lady. The birds are very busy in the morning. I got some really good pictures today. Just as well. This is a really boring time of year to take pictures. No flowers, nothing blooming. It’s all muddy and gray. If it weren’t for the birds, I wouldn’t have anything to shoot at all. Your deck has become the Grand Central Station of local wildlife. Yes, Tas, Grand Central Station with the birds vying for the best commuter treats and seats. What a great tale – isn‘t it just called LIFE? Things are happening while we turn the head ‚just for a second‘….!? 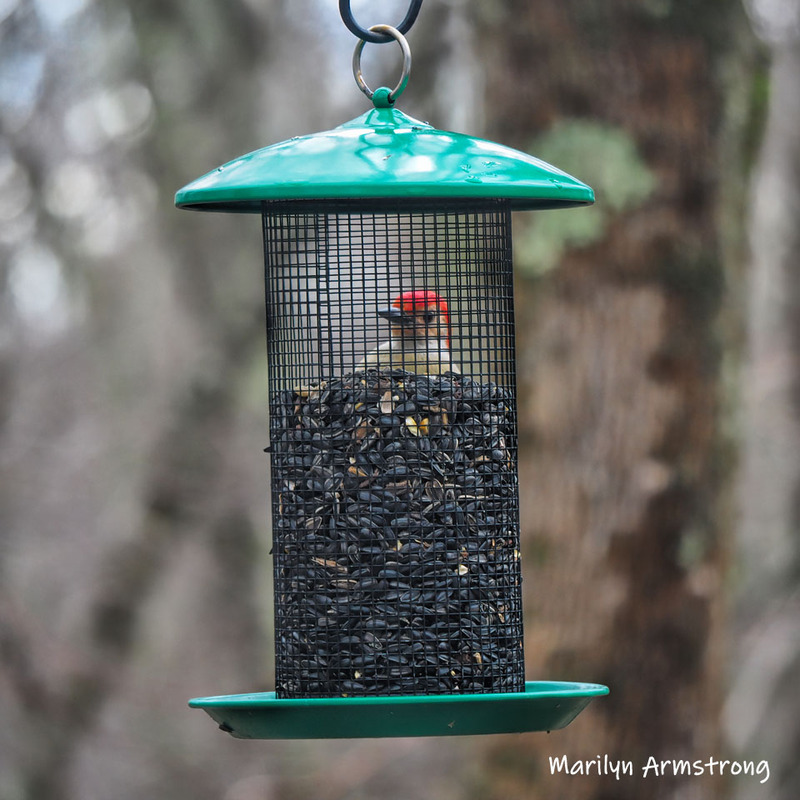 I absolutely ADORE the red woodpecker peeking through the fodder-cage – you should make that a picture in your kitchen! I would…. Thank you so much for just making my day. I also like Pat‘s comment – sadly, in the Paris region, no train or metro is *EVER* so empty as your feeder is when you‘re ready with your camera! It’s weird, actually, because I haven’t even turned the camera on. They just vanish. Sometimes, I can see them in the nearby trees, but usually, it as if they literally disappeared. 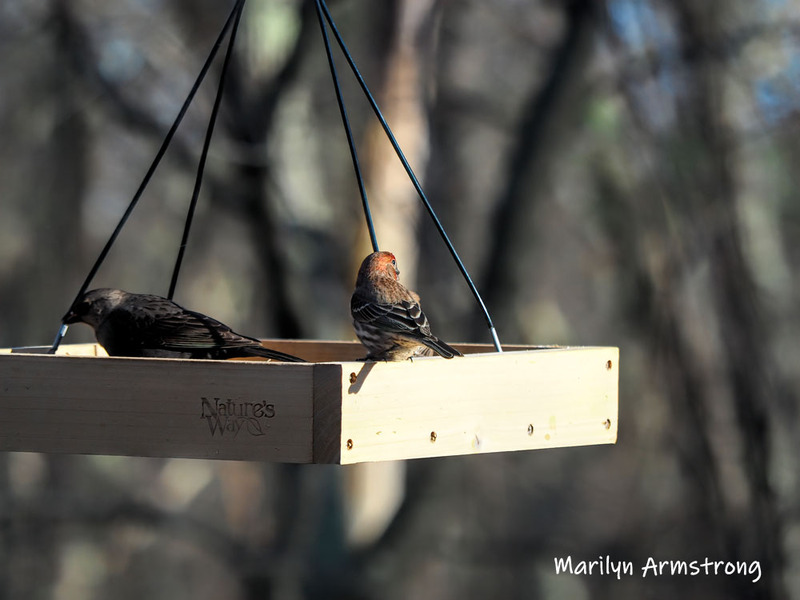 They don’t fly off the feeders, either. They just dive off. Today, though, I got some good pictures. They sat still for a while. Finally! What a lovely way to start the day. 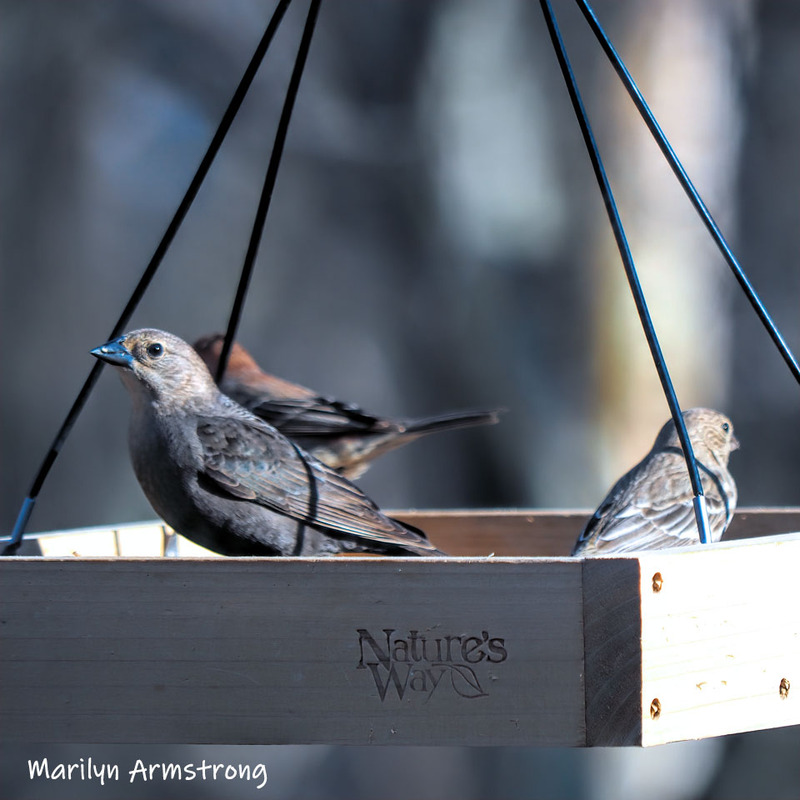 We don’t have cowbirds over here, but they look rather cute and they’re very photogenic. Glad to hear not all your garden visitors flew away when you picked up your camera. Great results – you’re a dab hand at snapping wildlife. 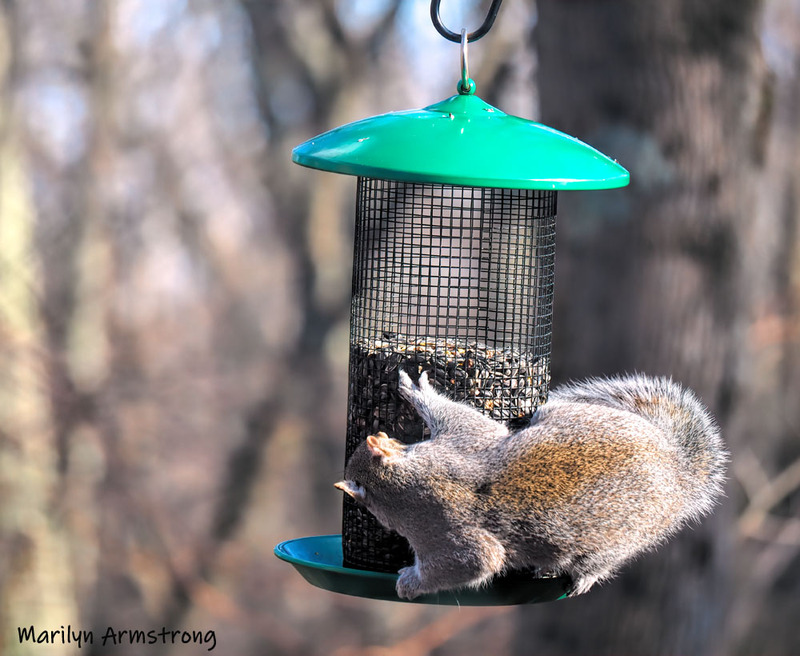 And of course, the ubiquitous squirrel – no garden well equipped with bird feeders would be complete without a squirrel getting in on the act. Great stuff. 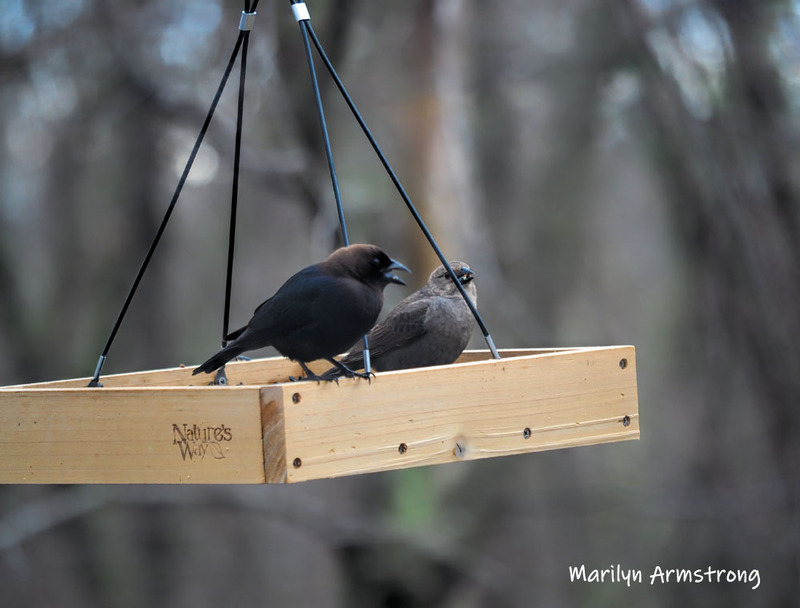 The cowbirds are long-time residents of the valley. Apparently the first arrived around 1830 and have been hanging around ever since. They don’t build nests. They drop their eggs into other birds’ nests and let them do the parenting, so a lot of people have a grudge against them. But they are pretty easy-going, non-bullying birds otherwise — except for that invader the nests of other birds issue. At least they don’t kill the other baby birds. They just leave an egg behind and move on. 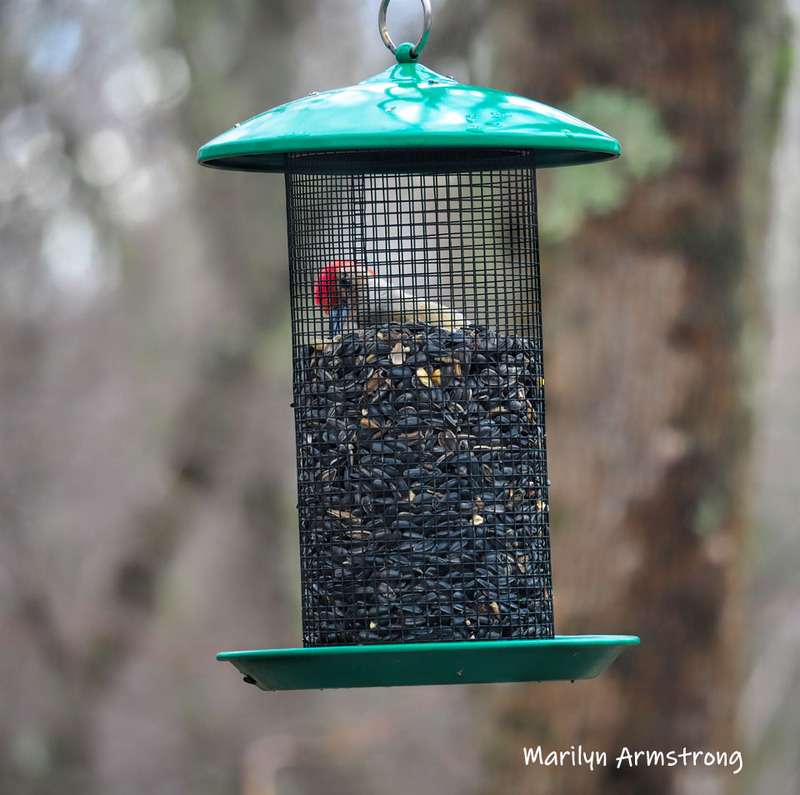 Love the woodpecker photo through the screen of the feeder- wonderful! That little squirrel is going to get grabbed by a hawk. There have been some BIG hawks — they might even be eagles because they are really huge — and they are hungry. That little guy doesn’t seem to get the whole thing about hiding when the big birds are flying. I know. I’m a typo artist myself. I’m a two finger speedy typist/typo meister. Leslie, as a young newsie at ABC News, my first gig was taking in phone voicers/voice reports and typing up verbatims. You had to be very fast and accurate, Many of these voicers were from overseas and on strict deadlines. I turned out to be one of the fastest and most accurate. I still don’t know how I managed that up against skilled typists. I wouldn’t try that today. I think maybe I was so driven by anxiety to succeed/not fail. Make sense? On ANOTHER note: Kevin Pillar, your former centerfielder, is having an excellent day with his new team, the San Francisco Giants. The Giants announcers are raving about getting Pillar in a “one-sided” deal. That aside, the Blue Jays really played the Red Sox well. Very agressive and doing surprising things — like stealing home. Sox looked dumb founded. We’re going to regret the loss of Kevin. We are having a lot going on sports wise. The Maple Leafs lost last nigh and I think the Raptors did too. But low and behold the Jays won. Leslie, a lot of sports talk about the Boston-Toronto rivalry, especially in hockey. I’m not a hockey fan but appreciate the passion of fans. I just never have been able to wrap my head around hockey. That attitude disturbed many people, including an old friend/former work colleague who used to play hockey WITHOUT a helmet.